We did it! We made it through a whole year of meal plans! If meal planning is part of your new year's resolutions for 2014, you can search the blog for 52 weeks of ideas, tips and tricks. 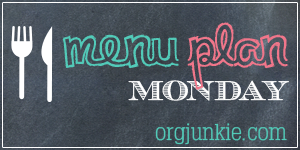 One of my plans for 2014, is to create a page here on the blog so you can easily find ALL of my meal plan links. With Christmas this week, it's a very light plan, but if we've learned anything this past year, it's that a plan sets our course, but isn't a mandate - it's only a plan. Wishing you many more meal plans to come! This post is linked up at I'm An Organizing Junkie - check it out for more ideas and inspiration, or to link up your own meal plan.